Regulatory impact on health insurance reforms. Congress spent most of 2017 attempting to pass health care reform legislation. In the end, the most significant legislative change was the elimination of the fine associated with an individual not being covered by a qualified health insurance plan. Upon being signed into law on December 22, 2017, the tax reform package effectively repealed what is known as the “individual mandate.” While Congress is unlikely to tackle any additional health insurance policy changes this year, the administration continues to be interested in making changes and has the regulatory authority to do so. The regulatory changes made will showcase the strength and power of the executive branch. While laws passed by Congress are binding, they only provide a framework and the principles to be followed—the bones of a policy, if you will. It is the responsibility of the appropriate executive branch agency to put the flesh on the legislative skeleton in the form of regulations. Agencies develop, propose, and then finalize regulations to either implement legislation that has been recently become law or to modify previous regulations to better match the policy priorities of the current administration. 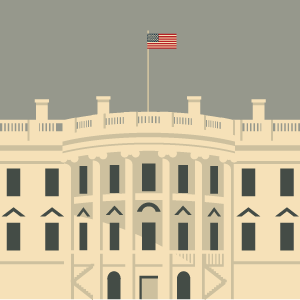 The most common trigger for a significant regulatory change is a new administration that follows the election of a new president—especially when the political affiliation of the incoming president is different than his predecessor. As we have seen with this administration, President Trump has directed his agency secretaries to roll back many regulations, some of which impact health care. Some regulations last for decades; others are short-lived. For example, the Obama administration implemented regulations to create the Comprehensive Care for Joint Replacement (CJR) bundled payment program for total knee arthroscopy and total hip arthroscopy episodes of care. CJR began in April 2016, then in the waning days of the Obama administration, the Department of Health and Human Services (HHS) published a proposal to expand the CJR bundled payment model to include Surgical Hip and Femur Fracture Treatment (SHFFT) episodes. However, upon entering office, President Trump froze the effective date of regulations that had been issued at the end of the Obama administration. HHS went on to tackle, and finally cancel, the planned expansion of CJR to include SHFFT. Last year, Trump announced that he intended to not reimburse insurance companies for the cost-sharing reductions (commonly referred to as subsidies) for qualifying purchasers of silver plans in the marketplace. HHS also shortened the standard open enrollment periods and reduced the federal funding for outreach and enrollment assistance for consumers seeking to buy non-group health insurance. In a March 2018 speech to the American Federation of Hospitals, HHS Secretary Alex Azar stated that one of the top four priorities for HHS is addressing the cost and availability of insurance, especially in the individual market.1 As of this writing, the executive branch has published two proposed rules this year that seek to expand the types of health insurance offerings and the avenues through which consumers can purchase them. Currently, trade associations that offer health insurance coverage are regulated by the same federal standards and state insurance regulations that apply to insurance coverage sold by health insurance issuers directly to individuals and small employers. In most situations involving employment-based association coverage, the group health plan exists at the individual-employer level and not at the association-of-employers level. As a result, the products sold by trade associations are generally treated as a collection of individual market coverage, small-group market coverage, large-group market coverage, or mixed associations of more than one coverage type. When assessing the type of coverage held by an individual, the Centers for Medicare & Medicaid Services (CMS) currently looks directly to the plan held by each association member and assesses whether or not the type of health care coverage meets its regulatory requirements. Separately, the Department of Labor (DOL) is responsible for determining when employers may join together in an employer group or association that is treated as the “employer” sponsor of a single multiple-employer group health plan. The DOL’s proposed rule seeks to implement a more flexible “commonality-of-interest” test as well as other new avenues by which Association Health Plans (AHPs) can be offered. This flexibility has been cited as a way sole proprietors and small business owners may have the option to band together and use an AHP to purchase health coverage for themselves and their employees. In order to determine eligibility for association coverage, the department’s evaluation process would focus on the association itself. Under this proposed rule, an AHP offered to a wide range of members would be treated as a single plan. The category of the plan (large- or small-group) would be determined by the number of enrollees in that entire AHP. Upon passing the 50-person threshold, a plan would be considered large-group and thereby exempt from the Affordable Care Act (ACA) requirements that individuals or those in small-group health insurance plans cover Essential Health Benefits (EHBs)—of which rehabilitative and habilitative therapy is a feature—and the use of a single systemwide risk pool in order to minimize the range of costs for higher-risk patients. The ACA also limits the multipliers of factors such as age, geographic location, and tobacco use, which insurers may use to determine the cost of an individual or small-group plan holder’s insurance premium. Individual health plans have caps on out-of-pocket expenses, and the annual deductibles on small-group plans are also restricted. In comments submitted to the DOL, PPS points out that while some argue that this purchasing power could reduce costs because of economies of scale, should an AHP have 51 or more participants, these ACA-imposed individual and small-group consumer protections would no longer be required. The DOL’s proposal would allow for a significant increase in the number of AHPs who were able to design benefit offerings that bypass the ACA’s safeguards for consumers utilizing individual and small-group health plans. By the DOL’s own admission within the proposed rule, the goal is to expand access to affordable health coverage, especially among small employers and self-employed individuals, by removing “undue restrictions” on the establishment and maintenance of AHPs. However, what the department has described as “undue restrictions” are, in part, the previously-mentioned consumer protections established by the ACA. 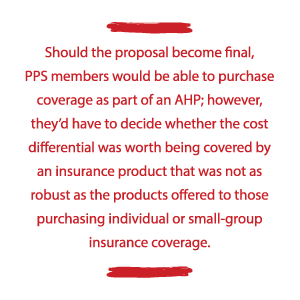 Should the proposal become final, PPS members would be able to purchase coverage as part of an AHP; however, they’d have to decide whether the cost differential was worth being covered by an insurance product that was not as robust as the products offered to those purchasing individual or small-group insurance coverage. The proposed rule also seeks to treat sole proprietors and other self-employed individuals as “working owners” who may choose to act as employers for purposes of participating in an employer group or association as well as be treated as employees of their businesses for purposes of being covered by the group or association’s health plan.5 This dual treatment would allow a self-employed small business owner to offer AHP group coverage to their employees while also qualifying as an employee of their own business in order to be eligible for the coverage offered by an AHP. In comments filed with the DOL, PPS requested that “working owners” be guaranteed the ACA’s consumer protections they currently access when they purchase their individual or small-group insurance. Additionally, the proposed rule wants to empower the formation of AHPs to sell insurance across state lines if its members have a principal place of business in a metropolitan area that includes more than one state like Greater New York City, the Quad Cities region spanning Illinois and Iowa, the Kansas City area which covers parts of Missouri and Kansas. This new criterion for formation of an AHP would not have a requirement that the members work in the same industry nor meet the commonality-of-interest threshold; instead, regional geographic proximity would be sufficient. While the proposed rule requested feedback regarding “concerns that associations could manipulate geographic classifications to avoid coverage to employers expected to incur more costly health claims,” the proposed rule failed to discuss other important factors to be considered when proposing to allow for the sale of insurance across state lines. First, how is the AHP to determine which of the region’s state insurance commissioners would be responsible for certifying that the AHP’s insurance coverage complied with minimum coverage requirements? Second, what protections would be in place to prevent associations from taking advantage of members by choosing to have their plans certified by the state with the least coverage requirements? To that end, in comments to the DOL, PPS requested that should the final rule allow for the formation of geographically centered AHPs functioning in a metropolitan region, that the final rule also contain formal guidelines to determine which state insurance commissioner would be responsible for certifying the health plans offered by the AHP in order to prevent forum shopping and a race-to-the-bottom. PPS also requested that the final rule include provisions to prevent associations from choosing to be governed by the state with the lowest minimum coverage requirements in order to market bare-bones plans. By law, short-term plans may be sold to individuals and families7 but are not required to comply with the ACA’s private non-group market regulations mentioned earlier, which guarantee issuance and renewal of insurance coverage, prohibit annual and lifetime benefit limits, require coverage of all EHBs, and other protections. Instead, short-term plans can have annual or lifetime limits, might cover fewer services, and can discriminate based on an individual’s health status and the presence of a pre-existing condition. After the passage of the ACA, most individuals purchased these plans as a way to access insurance between jobs or to bridge some other temporary coverage gap. However, it is important to note that without other coverage, someone buying a short-term policy would not have satisfied “the ACA’s individual responsibility requirement (the individual mandate) and would be subject to a financial penalty.”8 That all changed in December 2017 when the fine for not having qualified insurance coverage was reduced to zero, functionally repealing the individual mandate, effective January 2019 and opening the door for this regulatory change. As you can see, while Congress gets most of the credit for creating new policy, the executive branch also wields a lot of power—to not only proscribe but also alter the way those laws are fleshed out and implemented. In conjunction with the other significant health insurance policy changes made since the President Trump was sworn into office in January 2017, these regulations could have an impact on not only the range of coverage available in health insurance products, but the cost of that coverage as well. 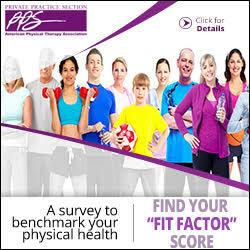 We will keep PPS membership apprised of how these changes will impact you as well as your patients. 3 www.gpo.gov/fdsys/pkg/FR-2018-01-05/pdf/2017-28103.pdf. See page 615. 4 www.gpo.gov/fdsys/pkg/FR-2018-01-05/pdf/2017-28103.pdf. See page 614. 5 www.gpo.gov/fdsys/pkg/FR-2018-01-05/pdf/2017-28103.pdf. See page 621. 7 Currently short-term plans are available in most states, but the type of temporary plan can vary considerably. There are five states (New York, New Jersey, Massachusetts, Rhode Island, and Vermont) where short-term plans aren’t available at all. www.healthinsurance.org/short-term-health-insurance. 9 www.gpo.gov/fdsys/pkg/FR-2018-02-21/pdf/2018-03208.pdf. See page 7440. 10 Once this is coupled with the additional significant changes that have been made to private non-group insurance markets since early 2017, some predict that the premiums for Obamacare plans could increase by double-digit percentages in most states next year. www.urban.org/research/publication/potential-impact-short-term-limited-duration-policies-insurance-coverage-premiums-and-federal-spending.